Stunning beaches, tropical vibes and perfect weather: that’s Belize in a nutshell. No wonder couples from all around the world are planning destination weddings in Belize. Let’s take a look at just why Belize is the perfect place to get hitched – and how to arrange a flawless, seamless wedding for a fraction of the cost of what you’d pay at home. Just a few hours from major cities in the US, Belize makes your destination wedding accessible. Guests won’t have far to fly, and they’ll enjoy an incredible tropical vacation without the usual price tag. With direct flights from many major US cities, getting to Belize is easier than ever. Plus, with its picturesque setting and bright good looks, Belize guarantees that your wedding photos will be unforgettable. Vivid tropical flowers, sun-kissed beaches and endless blue skies make every moment a photo-worthy one. Belize’s laid-back Caribbean feel will work its way into every part of your wedding, making it truly, amazingly unique. Perfect weather means you can be a summer bride all year round, and the casual dress code makes any dress perfect for the occasion. On top of that you’ll be able to take advantage of Belize’s incredible variety of cuisine and the music and rhythm that flows through our veins. Believe us: there’s no wedding reception like a Belizean one! Whether you’re looking for an all-in-one option or you’d rather DIY, there are plenty of options. Book a package, and pay a flat rate for your accommodations, meals, cake, ceremony and floral arrangements. Best of all, you’ll have someone on hand to help oversee it all, ensuring that your wedding day is laid back and stress free. That’s the Belizean way! Whether you want a casual beachside affair, a wedding with a jungle backdrop or a private island celebration for just you and your loved ones, Belize has what you need. Wonderfully diverse and unwaveringly spectacular, it’s the ideal setting for the most bohemian brides through to the most traditional. If the all-inclusive resort approach isn’t what you have in mind, don’t worry. You’ll be able to easily put together your dream wedding using local vendors. Once you’ve picked a destination, it’s likely your hosts will have local connections and will be able to help point you towards florists, musicians, planners and more. A tip: weddings in Belize cost a fraction of those in the US, but if you plan your wedding for the low season you’ll be able to save even more. You’ve picked that amazing destination. You’ve got your three-course meal all planned. And you’ve found just the spot for that first dance. But have you checked all the administrative boxes around tying the knot in Belize? Don’t worry – getting married in Belize is simple. There are just a handful of requirements you need to meet. First, you have to be in the country for at least 3 days before applying for a minister’s license to marry. You’ll need to submit this license to the Register General. The actual application process takes a day, and needs to be witnessed by a Senior Justice of the Peace. You’ll need to bring ID such as a passport or other proof of citizenship. If you’ve been married before, you’ll also need to prove that the partnership has been legally dissolved. The actual wedding requirements are easy as can be. All you need is an ordained Minister or other authorized person, and two witnesses – one male and one female. That’s all there is to it! Congratulations on your upcoming nuptials! 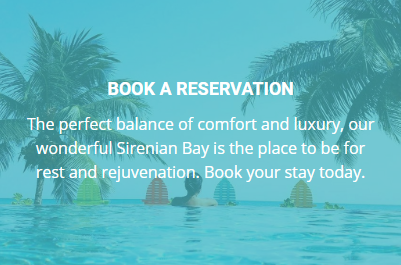 Belize is a stunning place for a destination wedding, and the family at Sirenian Bay would love to be a part of it.